Dr. David Segal is a professor at the University of California, Davis, in the Departments of Biochemistry and Molecular Medicine, Pharmacology, Genome Center, and MIND institute. Dr. Segal’s research focuses on engineering custom DNA-binding proteins and their application toward improving public health. This technology uses targetable nucleases and/or artificial transcription factors to make precise changes to the DNA of living cells or activate/repress specific genes of interest. Dr. Segal is a member of the FAST Integrative Research Environment Initiative (FIRE), a consortium of scientists, with precise expertise in Angelman Syndrome (AS), who work collaboratively to identify, characterize and implement new therapeutics for the treatment and ultimate cure of AS. This initiative was launched in 2013, includes five laboratories spanning four universities and is funded in full by donations made to FAST. To date, FAST’s investment in the FIRE Initiative stands at more than $3.4 million. The results of this collaboration have been remarkable and the FIRE team is now working with more than six pharmaceutical and biotechnology companies to prepare for and test potential therapeutics for human clinical trial. The focus of Dr. Segal’s research in Angelman Syndrome is to activate the paternal UBE3A gene through deactivation of the UBE3A-ATS (antisense transcript). 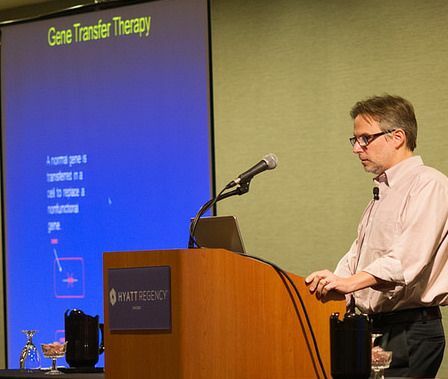 At the last FAST Summit, Dr. Segal discussed a compound called TAT-S1, that was found to cross the blood brain barrier after peripheral injection, and distribute widely throughout the brain, ultimately turning on UBE3A in the AS mice. This is incredibly promising, as to date getting therapeutics into the brain diffusely has proven to be very difficult. When Dr. Segal’s lab evaluated this strategy in live mice, with fluorescent imaging, the activity was only seen to last ~24 hours, so further evaluation of mechanisms for chronic therapeutic delivery are needed. The focus of Dr. Segal’s presentation was to discuss the progress in designing epigenetic regulators for persistent UBE3A activation. He focused on 3 aspects of his research: 1) Epigenetics, 2) In situ production of therapeutics, 3) The benefit of using rat models in AS. Segal’s previous work showed that by using targeted therapy (e.g. zinc fingers,) he could temporarily turn off the ATS and thus turn on paternal UBE3A. However, the factor must be present for UBE3A to be turned on. By making epigenetic modification therapy, these epigenetics can be used to keep UBE3A on more permanently. This could make a future therapy much cheaper and safer. In situ (meaning “in the location you want it/inside”) production of a therapeutic so that it can be made where it is needed and long-term, externalized delivery is not needed. Cell based delivery using mesenchymal stem cells (MSCs) for continuous synthesis of therapeutics in the brain without experiencing any immune response. Mesenchymal stem cells are “adult” stem cells that come from adipose tissue, better known as body fat. They are not embryonic stem cells, but are still able to be manipulated to become different cell types based on their location. MSCs are driven by the environment around them. If a cell-based delivery can be used through MSCs for continuous synthesis in the brain, this could result in no immune response. They can then be delivered to the brain and autonomously secrete proteins they were designed to release. Viral vectors (e.g. lentivirus) can be used to put the gene into the stem cells and then the stem cells will sit in the brain and function like a factory. A rat with a deletion of UBE3A was made via rat embryo manipulation. On 11/17/2015, rat pups were confirmed to have AS deletions. We are now breeding the AS rats and will begin the characterization of this novel animal model which will be a more effective tool for preclinical trials than the current AS mouse model. 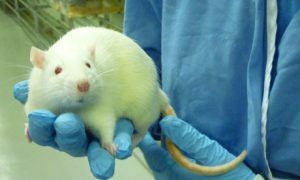 The AS rat model will not only help the FIRE researchers, but also the biotech and pharmaceutical companies that have started developing treatments for AS. Since Dr. Segal’s presentation at the last FAST Summit, two pharmaceutical companies have expressed interest in his approach to treating AS.